When we were planning our recent trip to Austin for Staple!, an independent small press expo, I almost forgot about a little gem I read about over at the AV Club — The house which served as the setting for Tobe Hooper’s The Texas Chainsaw Massacre (1974) was moved board-by-board to a town outside of Austin and transformed into a restaurant. While I have no affinity for anything horror-related, I knew that Paul, a huge horror movie fan, would get a kick out of it. (He saw the original movie while I could barely sit through the 2003 grisly remake.) So it was set. Once we landed in Austin, we sought out Whataburger for a fish sandwich post and headed out to Kingsland for some movie history and grub. Here’s one thing I wish I had known about Austin before heading out: the traffic. What normally would have taken us less than 40 minutes in San Diego took us well over an hour via a two-lanes highway heading out of the city, hitting gridlock and traffic lights. But along the way, saw a dead armadillo and enjoyed the Texas scenery while building an appetite. The Junction House is located a few yards off the main highway. 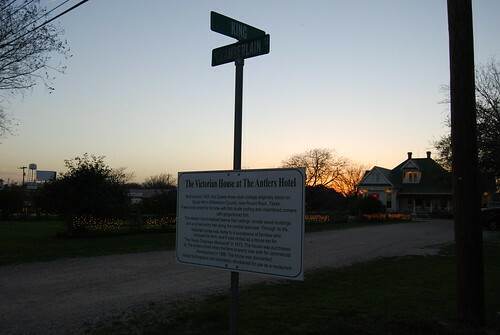 A sign outside indicates it’s a Queen Anne-style cottage built in 1909 but it’s only at the very bottom does it mention that it was used in the filming of The Texas Chainsaw Massacre. There’s one thing to know about this place: the Junction House prides itself on its food first, historical film significance second. 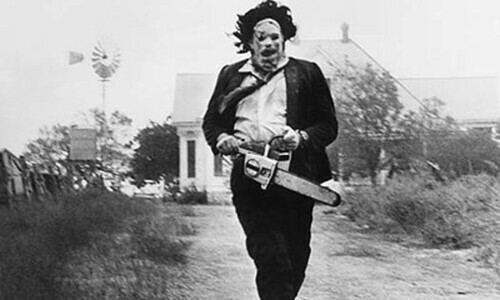 So it was a bit of surprise that we briefly spotted someone wearing a Leatherface mask in the first floor window while taking exterior shots of the house. The Junction House serves comfort food. Their specialties include all-you-can-eat-fried chicken on Tuesdays, fried okra, catfish, prime rib specials on Fridays and other southern specialties. Dinner is served daily with brunches available on Sunday. And no, there is no bbq anywhere on the menu. Paul was immediately sold on their special, a shrimp etouffee on a crawfish cheesecake after hearing another diner sing its praises. I went with shrimp and grits. I’m in the south after all. 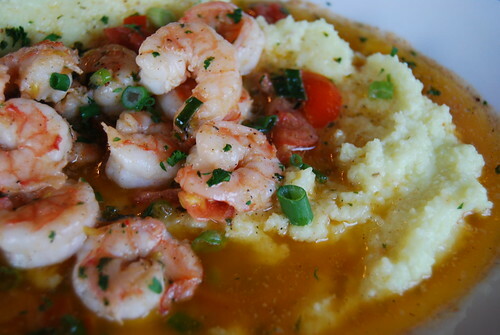 The shrimp and grits came out with a moat of melted butter surrounding the grits and piles of shrimp. The server commended me on my selection saying it’s her favorite of the menu items. This was different from previous incarnations of grits I’ve had. The grits were firm and almost polenta-like in texture. I assume that it was baked prior to serving to get some of the hard ridges. And there was no skimping on the shrimp which were cooked perfectly. It was nicely seasoned with refreshing bursts of grape tomatoes. I can say with authority that I’ve never had a meal like this and will happily try to replicate this at home as much as possible, but with a less butter. With neither of us familiar with etouffee, I took the person’s word next to us that it was as authentic as it could be despite it being more commonly found in Louisiana than Texas. 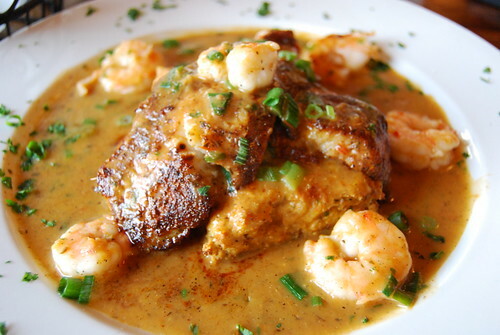 The brown roux was littered with a few shrimps but the masterpiece was the crawfish cheesecake with several pieces of blackened flounder on top. Even the waitress admitted the “crawfish cheesecake” was difficult to sell to the patrons. This savory cheesecake included minced crawfish with cream cheese and what seemed like a bread bottom crust. While it’s a lot of components on one plate, it all worked together. We reluctantly switched plates halfway through the meal each exclaiming that one dish was better than the other but really it was all good. 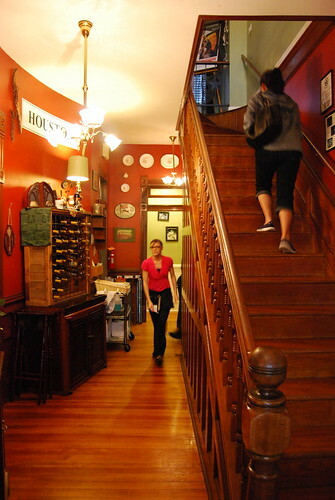 Service was relatively quick so most of the exploring was left after dinner. The entire bottom of the house was taken up by the kitchen, bathrooms and dining area (Paul tells me we dined in the movie’s “Bone Room”). 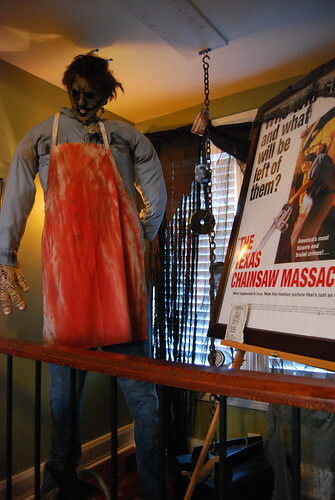 Upstairs was a mish mash of Texas Chainsaw Massacre memorabilia and odd pop-culture items that didn’t seem to belong. What’s a Star Wars poster doing here? And the person seen wearing the mask earlier in the evening was the same diner who touted the shrimp etouffee when we first arrived. He was hanging out upstairs wearing his mask. Mystery solved. While the lure of horror film history was the initial reason for the visit, a revisit would be because of the food… even with traffic. That movie was really scary! I remember watching it with my older sister and closing my eyes for most of the movie. Now as an adult, I don’t know which is scarier: the pool of butter or the movie!! I have not seen the original but I agree that all the butter is almost as scary as the film! Yummy looking food! Creepy looking props. Just reseaching and, well i need to learn more about this!! Everyone one says the case still remains open and what if the guy who killed all those ppl is still alive! I live in Teaxs and knowing this is a true story is scary and makes me think theres more ppl out here in teaxs who eat there own kind. Anyways looking for some help if someone has the chance.. THANK YOU! Etouffe is food of the gods. Shrimp and grits, too. Crazy good! I have never seen the movie and have no intention to; but I will never turn down crawdads and shrimp! Please update info. The Junction House changed ownership. The new name is Grand Central Cafe. The new phone nbr is 325-388-6022. The old nbr is 325-388-3800 is the nbr to our business in Kingsland….Pool and Callahan. 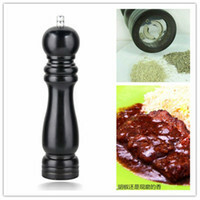 We are constantly getting calls for info about the restaurant.